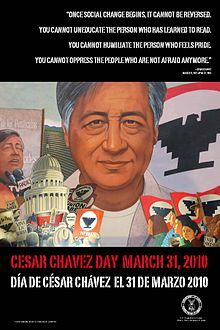 César Estrada Chávez (31 March 1927 – 23 April 1993) was an American farm worker, labor leader and civil rights activist, who, with Dolores Huerta, co-founded the National Farm Workers Association (later the United Farm Workers union, UFW). We seek our basic, God-given rights as human beings. Because we have suffered — and are not afraid to suffer — in order to survive, we are ready to give up everything, even our lives, in our fight for social justice. Once social change begins, it cannot be reversed. You cannot uneducate the person who has learned to read. You cannot humiliate the person who feels pride. You cannot oppress the people who are not afraid anymore. You are here to discuss a matter which is of extreme importance to yourselves, your families and your community, so let's get to the subject at hand. A hundred and fifty-five years ago, in the state of Guanajuato in Mexico, a padre proclaimed the struggle for liberty. He was killed, but ten years later Mexico won its independence. We Mexicans here in the United States, as well as all other farm workers, are engaged in another struggle for the freedom and dignity which poverty denies us. But it must not be a violent struggle, even if violence is used against us. Violence can only hurt us and our cause. The law is for us as well as the ranchers. The strike was begun by the Filipinos, but it is not exclusively for them. Tonight we must decide if we are to join our fellow workers. I became a vegetarian after realizing that animals feel afraid, cold, hungry and unhappy like we (humans) do. We need, in a special way, to work twice as hard to make all people understand that animals are fellow creatures, that we must protect them and love them as we love ourselves... The basis for peace is respecting all creatures... That's the basis, the beginning for peace. ...We know we cannot defend or be kind to animals until we stop exploiting them - exploiting them in the name of science, exploiting animals in the name of sport, exploiting animals in the name of fashion, and yes, exploiting animals in the name of food. We, the undersigned, gathered in Pilgrimage to the capital of the State in Sacramento in penance for all the failings of Farm Workers as free and sovereign men, do solemnly declare before the civilized world which judges our actions, and before the nation to which we belong, the propositions we have formulated to end the injustice that oppresses us. We seek the support of all political groups and protection of the government, which is also our government, in our struggle. For too many years we have been treated like the lowest of the low. Our wages and working conditions have been determined from above, because irresponsible legislators who could have helped us, have supported the rancher's argument that the plight of the Farm Worker was a "special case." They saw the obvious effects of an unjust system, starvation wages, contractors, day hauls, forced migration, sickness, illiteracy, camps and sub-human living conditions, and acted as if they were irremediable causes. The farm worker has been abandoned to his own fate — without representation, without power — subject to mercy and caprice of the rancher. We are tired of words, of betrayals, of indifference. To the politicians we say that the years are gone when the farm worker said nothing and did nothing to help himself. From this movement shall spring leaders who shall understand us, lead us, be faithful to us, and we shall elect them to represent us. We shall be heard. We seek, and have, the support of the Church in what we do. At the head of the pilgrimage we carry La virgen de la Guadalupe because she is ours, all ours, Patroness of the Mexican people. We also carry the Sacred Cross and the Star of David because we are not sectarians, and because we ask the help and prayers of all religions. We are suffering. We have suffered, and we are not afraid to suffer in order to win our cause. We have suffered unnumbered ills and crimes in the name of the Law of the Land. Our men, women, and children have suffered not only the basic brutality of stoop labor, and the most obvious injustices of the system; they have also suffered the desperation of knowing that the system caters to the greed of callous men and not to our needs. Now we will suffer for the purpose of ending the poverty, the misery, and the injustice, with the hope that our children will not be exploited as we have been. They have imposed hunger on us, and now we hunger for justice. We draw our strength from the very despair in which we have been forced to live. We shall endure. The ranchers want to keep us divided in order to keep us weak. Many of us have signed individual "work contracts" with the ranchers or contractors, contracts in which they had all power. These contracts were farces, one more cynical joke at our impotence. That is why we must get together and bargain collectively. We must use the only strength that we have, the force of our numbers. The ranchers are few; we are many. United we shall stand. We shall Strike. We shall pursue the revolution we have proposed. We are sons of the Mexican Revolution, a revolution of the poor seeking, bread and justice. Our revolution will not be armed, but we want the existing social order to dissolve, we want a new social order. We are poor, we are humble, and our only choices is to Strike in those ranchers where we are not treated with the respect we deserve as working men, where our rights as free and sovereign men are not recognized. We do not want the paternalism of the rancher; we do not want the contractor; we do not want charity at the price of our dignity. We want to be equal with all the working men in the nation; we want just wage, better working conditions, a decent future for our children. To those who oppose us, be they ranchers, police, politicians, or speculators, we say that we are going to continue fighting until we die, or we win. 'We shall overcome. Across the San Joaquin Valley, across California, across the entire Southwest of the United States, wherever there are Mexican people, wherever there are farm workers, our movement is spreading like flames across ad dry plain. Our pilgrimage is the match that will light our cause for all farm workers to see what is happening here, so that they may do as we have done. The time has come for the liberation of the poor farm worker. A similar statement (perhaps used in a later declaration) has been quoted at the UFW site: "Across the San Joaquin valley, across California, across the entire nation, wherever there are injustices against men and women and children who work in the fields — there you will see our flags — with the black eagle with the white and red background, flying. Our movement is spreading like flames across a dry plain." What do we want the Church to do? We don't ask for more cathedrals. We don't ask for bigger churches of fine gifts. We ask for its presence with us, beside us, as Christ among us. When we refer to the Church we should define the word a little. We mean the whole Church, the Church as an ecumenical body spread around the world, and not just its particular form in a parish in a local community. The Church we are talking about is a tremendously powerful institution in our society, and in the world. That Church is one form of the Presence of God on Earth, and so naturally it is powerful. It is powerful by definition. It is a powerful moral and spiritual force which cannot be ignored by any movement. When the strike started in 1965, most of our friends forsook us for a while. They ran — or were just too busy to help. 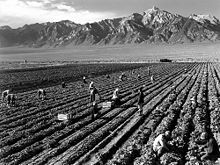 But the California Migrant Ministry held a meeting with its staff and decided that the strike was a matter of life or death for farm workers everywhere, and that even if it meant the end of the Migrant Ministry they would turn over their resources to the strikers. The political pressure on the Protestant Churches was tremendous and the Migrant Ministry lost a lot of money. But they stuck it out, and they began to point the way to the rest of the Church. In fact, when 30 of the strikers were arrested for shouting Huelga [Strike], 11 ministers went to jail with them. The growers in Delano have their spiritual problems... we do not deny that. They have every right to have priests and ministers who serve their needs. But we have different needs, and so we needed a friendly spiritual guide. And this is true in every community in this state where the poor face tremendous problems. But the opposition raises a tremendous howl about this. They don't want us to have our spiritual advisors, friendly to our needs. Why is this? Why indeed except that there is tremendous spiritual and economic power in the church. The rich know it, and for that reason they choose to keep it from the people. We should be prepared to come to the defense of that priest, rabbi, minister, or layman of the Church, who out of commitment to truth and justice gets into a tight place with his pastor or bishop. It behooves us to stand with that man and help him see his trial through. It is our duty to see to it that his rights of conscience are respected and that no bishop, pastor or other higher body takes that God-given, human right away. What do we want the Church to do? We don't ask for more cathedrals. We don't ask for bigger churches of fine gifts. We ask for its presence with us, beside us, as Christ among us. We ask the Church to sacrifice with the people for social change, for justice, and for love of brother. We don't ask for words. We ask for deeds. We don't ask for paternalism. We ask for servanthood. Today, thousands of farm workers live under savage conditions — beneath trees and amid garbage and human excrement — near tomato fields in San Diego County, tomato fields which use the most modern farm technology. All my life, I have been driven by one dream, one goal, one vision: to overthrow a farm labor system in this nation that treats farm workers as if they were not important human beings. Farm workers are not agricultural implements; they are not beasts of burden to be used and discarded. That dream was born in my youth, it was nurtured in my early days of organizing. It has flourished. It has been attacked. I'm not very different from anyone else who has ever tried to accomplish something with his life. My motivation comes from my personal life, from watching what my mother and father went through when I was growing up, from what we experienced as migrant workers in California. That dream, that vision grew from my own experience with racism, with hope, with a desire to be treated fairly, and to see my people treated as human beings and not as chattel. It grew from anger and rage, emotions I felt 40 years ago when people of my color were denied the right to see a movie or eat at a restaurant in many parts of California. It grew from the frustration and humiliation I felt as a boy who couldn't understand how the growers could abuse and exploit farm workers when there were so many of us and so few of them. I've traveled through every part of this nation. I have met and spoken with thousands of Hispanics from every walk of life, from every social and economic class. And one thing I hear most often from Hispanics, regardless of age or position, and from many non-Hispanics as well, is that the farm workers gave them the hope that they could succeed and the inspiration to work for change. From time to time, you will hear our opponents declare that the union is weak, that the union has no support, that the union has not grown fast enough. Our obituary has been written many times. How ironic it is that the same forces that argue so passionately that the union is not influential are the same forces that continue to fight us so hard. Today, the growers are like a punch-drunk old boxer who doesn't know he's past his prime. The times are changing. The political and social environment has changed. The chickens are coming home to roost — and the time to account for past sins is approaching. These trends are part of the forces of history that cannot be stopped. No person and no organization can resist them for very long. They are inevitable. Once social change begins, it cannot be reversed. But we're more than an institution. For nearly 20 years, our union has been on the cutting edge of a people's cause — and you cannot do away with an entire people; you cannot stamp out a people's cause. And on that day, our nation shall fulfill its creed — and that fulfillment shall enrich us all. As we enter a new decade, it should be clear to all of us that... we have miles to go before we reach the promised land. The men who rule this country today never learned the lessons of Dr. King, they never learned that non-violence is the only way to peace and justice. Our nation continues to wage war upon its neighbors, and upon itself. Dr. King was a powerful figure of destiny, of courage, of sacrifice, and of vision. Few people in the long history of this nation can rival his accomplishment, his reason, or his selfless dedication to the cause of peace and social justice. Today we honor a wise teacher, an inspiring leader, and a true visionary, but to truly honor Dr. King we must do more than say words of praise. We must learn his lessons and put his views into practice, so that we may truly be free at last. Many people will tell you of his wonderful qualities and his many accomplishments, but what makes him special to me, the truth many people don't want you to remember, is that Dr. king was a great activist, fighting for radical social change with radical methods. While other people talked about change, Dr. King used direct action to challenge the system. He welcomed it, and used it wisely. Dr. King was also radical in his beliefs about violence. He learned how to successfully fight hatred and violence with the unstoppable power of nonviolence. He once stopped an armed mob, saying: "We are not advocating violence. We want to love our enemies. I want you to love our enemies. Be good to them. This is what we live by. We must meet hate with love." My friends, as we enter a new decade, it should be clear to all of us that there is an unfinished agenda, that we have miles to go before we reach the promised land. The men who rule this country today never learned the lessons of Dr. King, they never learned that non-violence is the only way to peace and justice. Our nation continues to wage war upon its neighbors, and upon itself. My friends, the time for action is upon us. The enemies of justice wants you to think of Dr. King as only a civil rights leader, but he had a much broader agenda. He was a tireless crusader for the rights of the poor, for an end to the war in Vietnam long before it was popular to take that stand, and for the rights of workers everywhere. Dr. King's dedication to the rights of the workers who are so often exploited by the forces of greed has profoundly touched my life and guided my struggle. Just as Dr. King was a disciple of Gandhi and Christ, we must now be Dr. King's disciples. Dr. King challenged us to work for a greater humanity. I only hope that we are worthy of his challenge. One of the heroic figures of our time. Our separate struggles are really one. A struggle for freedom, for dignity, and for humanity. … You and your valiant fellow workers have demonstrated your commitment to righting grievous wrongs forced upon exploited people. We are together with you in spirit and determination that our dreams for a better tomorrow will be realized. Jeffrey Moussaieff Masson, The Pig Who Sang to the Moon: The Emotional World of Farm Animals (Ballantine Books, 2004), Conclusion, p. 226. "The 1965 Grape Boycott: A Case Study in Strategy"